This Irish Christmas ornament is made by a process known as Intarsia which is the ancient art of making pictorial mosaics by laying precious and exotic woods onto a solid wood surface. Seven different woods are used to make this Celtic cross design. 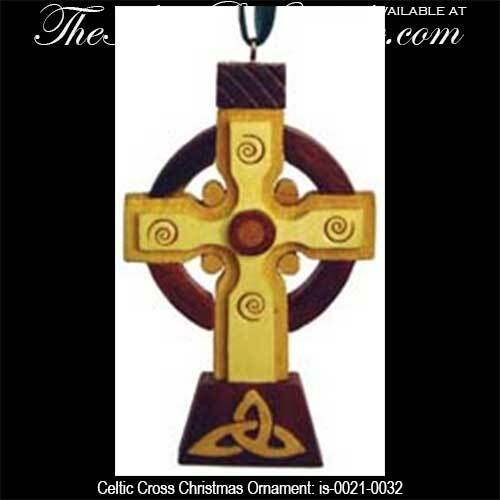 This wooden Celtic cross ornament features a dimensional double sided design and measures 2 1/2" wide x 4" tall. The Irish Christmas ornament is ready to hang with the included green ribbon and is gift boxed with Celtic knot and Celtic cross history cards, complements of The Irish Gift House. 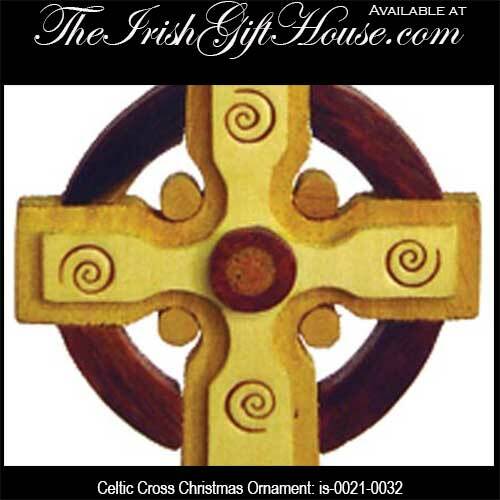 This Celtic cross is made in Ireland by Islandcraft.